Former CIA director John Brennan has become the latest member of the NBC News and MSNBC family, officially signing with the network as a contributor. Brennan will serve as a senior national security and intelligence analyst for the networks, the company announced Thursday, adding that his first official appearance will come on this Sunday’s “Meet the Press” with Chuck Todd. Another person familiar with the matter said he would take the stage at “Morning Joe” on Monday. The news was first reported in the Axios newsletter. 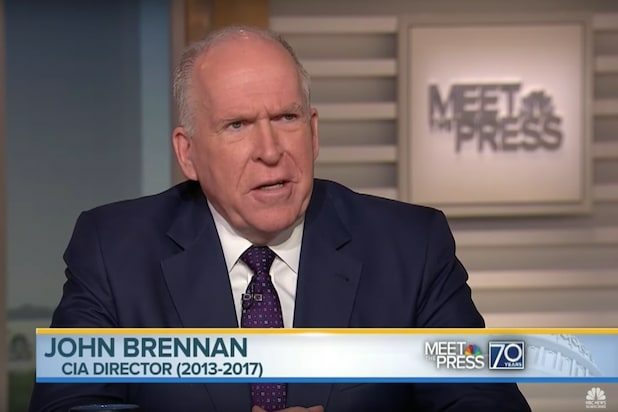 Brennan has long been a familiar face on the small screen airwaves, with notable appearances on both CNN and MSNBC and other networks. Mika gets braces... and the panel can't help but notice. Joe and Mika read mean tweets from viewers. The gang crack up over Rep. Steve LaTourette's (R-OH) "sucking" sound remark made on the floor of Congress. Mika loses it to an unfunny David Letterman spoof, leaving her co-hosts perplexed. The crew crack up over Barak Obama's dog story. Joe and Mika couldn't get through a story about PETA and turkeys with a straight face. Mika, Joe and Chuck Todd discuss, among other things, Willie Geist's pearl necklace. Whatever you do, don't Google it. Joe broke out his Elizabeth Warren impression, acting out a scene where Obama throws her under the bus.